There are several actions you need to do to keep your Contacts list current. This article helps you organize your contacts so that you can easily find the people who you need to get in touch with. The search box is located in the Contacts list, under the Contacts icon, and in the Phone view, under the Phone icon. You can search for the names of people or for a skill (job title), and then add them to your Contacts list, for example. In the search box, type a name, email alias, or phone number. You can even type the name of a distribution group or alias. Microsoft Lync 2010 communications software displays the results as you type. If more than one contact or group comes up, the one who is in your Contacts list will appear at the top of the list. All contacts and non-contacts will have a vertical status bar to the left of the person’s picture, and will indicate presence, such as Available, Offline, and Busy. If your company uses Microsoft SharePoint services, Name and Skill buttons appear below the search box. You can search by using a keyword, such as job title or area of expertise. Click Skill to see others with similar areas of expertise or job titles. Click the X in the search box to return to the Contacts list. The previous topic indicates that you can search for a person by using a name, email alias, or a phone number. For this procedure, we will use as an example, a search by name. So, after you’ve completed your search, a list of people whose names match the search is displayed. On the person’s contact card, you can use either the Add to Contacts List selection or the Add button. Tip: Type the person’s full name (or most of it) in the search box, because if you type only a first name, especially a commonly used name, you’ll get several returns. If your company has configured a limit on the number of people displayed, you’ll then need to refine and re-do your search if the contact you want wasn’t listed. The default maximum number of contacts that can be added is 1000. Your actual number is set by your support team, so contact them for information if that number has not been made available to you. Lync 2010 can display presence information for contacts who use email services such as the Windows Live network of Internet services (including MSN and Hotmail), AOL®, and Yahoo!®, and who are joined to Lync. Federated users (users who are outside your company) can do activities such as share presence information, make Lync calls, and conduct video conferences. In the contact card that appears, click the Add button. Select a contact group in which to place the contact. Also, you can create a new group at this time by typing the name beside the New Group field. Some users have an email account with a service that is not federated with Lync. Although you can add these users to your Contacts list in the same way you add federated users, you won’t see presence information for them. Other users sign in to a federated site by using their non-federated user ID (email address). If this is the case, use the format user(unfederated.com)@federatedcompany.com--for example, MrContoso(gmail.com)@msn.com.--when you add the contact. Using this format will ensure that his or her presence will display in Lync. When you’ve found the contacts that you want, you can add them to a contact group so you can find them easily next time. 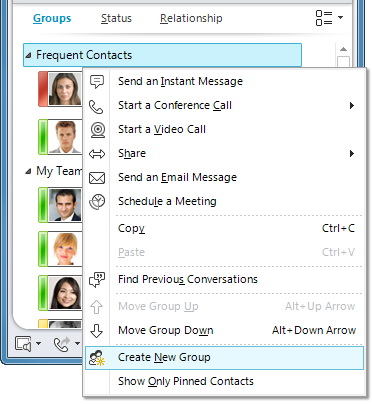 Lync automatically populates Frequent Contacts based on the 10 contacts with whom you most often have conversations. You can also “pin” your most important contacts to the top of the group for quick access. Lync pre-populates the pinned list with your team members. When you create a group in Lync, it's called a contact group because it organizes your contacts in groups that are meaningful to you. You can IM them, email them, and set up meetings with them. You might have heard of Office 365 Groups. An Office 365 Group is a shared workspace for email, conversations, files, and calendar events where group members can collaborate and quickly get stuff done. You can't create an Office 365 Group from Lync. See Learn about Office 365 Groups for more information. Note: When you create your first contact group Lync also automatically creates a group for you called Other Contacts. You can assign to this group new contacts who don’t require more specific group memberships. Right-click the name of the group you want to delete, then select Delete Group from the drop-down menu. Note: The Frequent Contacts and Other Contacts groups are automatically generated and therefore cannot be deleted. Right-click the group name on the Contacts list, select Rename Group, and then type the new group name. You can sort your contacts according to various categories (their status, group membership, and privacy relationships), and you can choose how you want to display the individual contact listings. To organize your contacts so that those who are online display at top of the list, click Status. Your online contacts will display at the top, followed by those with a status of Away, Unknown, and Unavailable. To display your contacts according the groups they are members of (including the default groups Frequent Contacts and Other Contacts and any groups you’ve created), click Groups. Click the arrow next to the Display Options button below the search box to display the Layout Options menu. Note: You can also turn off pictures everywhere in Lync by clicking My Picture in the Lync - Options dialog box. For more information, see Set picture options. In your Contacts list, click the Display Options button below the search box to switch between one and two lines of information per contact. If your company uses contact photographs, a two-line view displays the photos. In your Contacts list, click the Relationship button below the search box. In your Contacts list, do the following to move, copy, and remove or delete contacts. To copy the contact to another group, right-click the contact, click Copy Contact to, and then click the group you want. Important: When you remove a contact from one group, that contact will be removed from your Contact List entirely unless he or she still has membership in another of your groups. Important: Depending on how you are viewing contacts (by group, status, or relationship), moving and copying functions differ. Be aware that dragging contacts between privacy relationship groups changes the privacy relationship for the contact. Note: Your Contacts list can't be exported to or copied by other Lync users. Every person’s Contacts list will be different because everyone has unique relationships, privacy requirements, and communication preferences. A simple way to share key professional contacts with coworkers is to create a key-contacts distribution list in Outlook from which everyone can select contacts to add to their Contacts lists in Lync. In your Contacts list, point to a contact’s picture (or status icon, if pictures aren’t displayed) to see a basic contact card. Right-click the contact in the Contacts list, and then click Change Privacy Relationship.